Butterscotch Gums - the flavour of a butterscotch boiled sweet crossed with a hard, chewy gum - the best of both worlds! - Qty In Order: a quarter of a kilogram - just over 8.8 ounces... More..
Lions Fruit Salad Gums - harder than the other fruit salad gums that we sell. Lions make delicious gum sweets with delicious individual and distinctive flavours. - Qty In Order: a quarter of a kilogram - just over 8.8 ounces... More..
Lions Wine Gums - When it comes to Wine Gums, many of you say "Lions or nothing!" 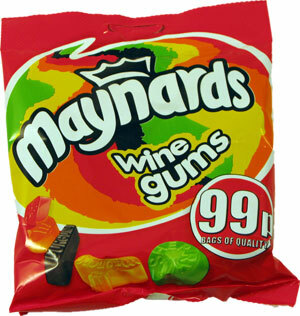 Apparently, they`re made according to the original Lions recipe (from way way back), and the way they`re made makes for a firmer texture, and longer-lasting flavour ... More..
Maynards Wine Gums - classic chewy fruity juicy gums - ..we now sell Maynards because they are quite simply the best!! - Qty In Order: 2 x 170g bags (that`s just under 12 ounces of the delicious little blighters!)... More..
Midget Gems - Little mini fruity gums in lots of different flavours. Nice and diddy - perfect if you want to chomp discreetly (it`s just impossible to share sometimes!) - Qty In Order: a quarter of a kilogram - just over 8.8 ounces... More.. Alphabet Letters Gums - Educational and utterly delicious - who would've thought we'd be able to come up with such a combination? Just no spelling out rude words... ok? - Qty In Order: a quarter of a kilogram - just over 8.8 ounces... More.. Milk Gums - delicious traditional favourites - milk chews in the shape of little milk bottles - made by Trebor Bassett Maynards. - Qty In Order: a quarter of a kilogram - just over 8.8 ounces... More..
American Hard Gums - large, chewy, sugar coated fruity gums - guaranteed to stick to your teeth! - Qty In Order: a quarter of a kilogram - just over 8.8 ounces... More..
Floral Gums - they taste of flowers! Floral Gums are a real old favourite from the past - we received lots of requests to hunt them down - so we did! If you haven`t tried them before - they are little, hard, gummy, gently scented and flavoured gum sw... More..
Lions Midget Gems - Aaaaaah, Lions Midget Gems. . .. Deliciously juicy little fruity gums. Don`t they just take you back? Many of you regularly ask: "Is the black one liquorice? ", and the answer is a resounding YES! We can guarantee it - because ... More..